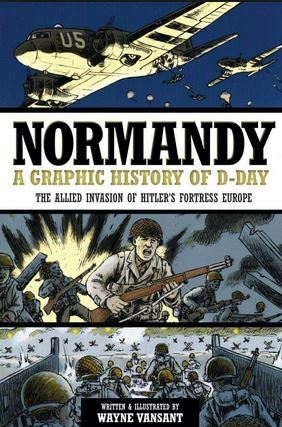 Normandy: A Graphic History of D-Day, The Allied Invasion of Hitler’s Fortress Europe by Wayne Vansant is a graphic novel recounting the events of that fateful day and those leading up to it. Normandy: A Graphic History of D-Day, The Allied Invasion of Hitler’s Fortress Europe by Wayne Vansant connects to the reader more than a mere history book. The excellent art draws attention to historical details in vivid details and colors. Mr. Vansant starts at the weeks and months ramping up to D-Day, and ends at the liberation of Paris – about two months after D-Day. The author does a great job educating the reader about the leaders who made great, lucky and disastrous decisions on both sides as well as the consequences suffered by the civilian population of the battlefield. The author does an excellent job representing all the countries who participated in the invasion of Europe, not just the big ones we hear and learn about. A special mention of the Polish 1st Armored Division who suffered heavy losses defending Mont-Ormel against the 2nd and 9th SS Panzer Divisions – an especially poignant and somber note because they were not allowed to return to Poland afterwards. The graphic novel also tells of some of the bravery exhibited by the Wermacht soldiers and tank commanders. This point illustrates that brave men fought on both sides, men who were dedicated to their countries and did not give up easily. I read this book on an eReader using the app from ComixOlogy and I must say I was impressed. The app downloaded and installed easily, my account (which I set up previously) was recognized and the comic book was downloaded. The panels were easy to read and the app made them easy to follow as well. The book also tells of the way airpower was used besides ground troops and the strategies used during the war (as well as those that went wrong). The book has some blood and guts in it, but it is not gory and the author has done his research historically, as well as given the reader a different way to look at D-Day. Sounds great! I’m a fan of graphic narrations of history. Have you read the Terry Deary Horrible History series? No I have not but thanks for the recommendation. I love these kinds of books. The art in this one does look good I am going to have to take a look at it. Currently reading a Vietnam war novel by Kent Hinckley called Hearts, Minds and Coffee. It’s a great read, I have been enjoying it.